How to Recover Deleted Files From Your Windows? Rapid developments in technology also have increased the utilization of computer and mobile throughout the world. The increase of the system users also points out some problems as well as solutions for it which needs to be upgraded. One of such problems is the deletion of files from the system in which if a file is permanently deleted from the computer then it can’t be retrieved by the inbuilt operating system or the applications software in it. However, there is a solution for this as well that can be done by installing third-party software known as recovery software. This recovery software can detect the searched file from the hard drive and restores them to the central processing unit. Deletion of files without self-interest or rather mistaken with other files with the same name or size is prominent with the regular system users. If a file is deleted from the system then it gets stored to the recycle bin and can be restored with just one click. The main problem arises when the Shift+delete operation is performed or files from recycle bin is deleted intentionally. Those deleted files can’t be seen in the system directly but it remains in the hard drive until it is overwritten by some other files after the operation is performed. 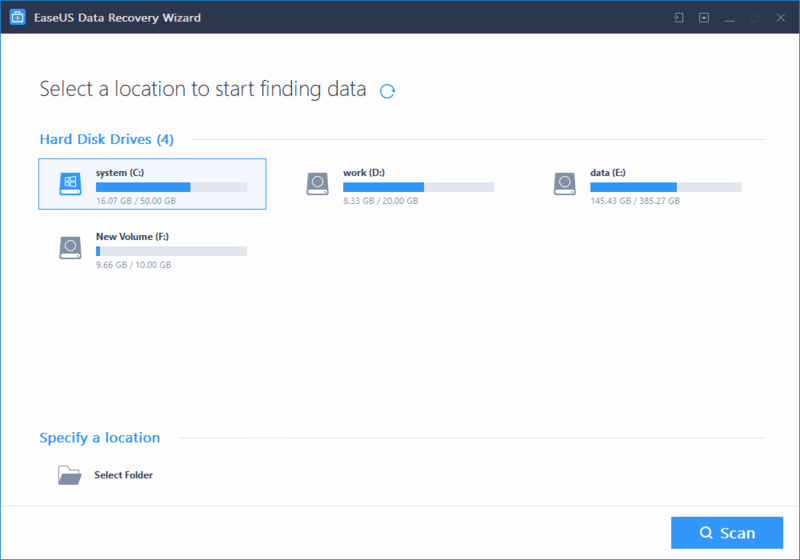 Third party free data recovery software such as EaseUS wizard scans the hard drive including the system memory, detects them and can also restore them to any wanted folder in the system within no time taken for processing. Download the EaseUS apk file from the official website easeus.com where you can find both the options of Windows as well as Mac. Download the windows version of recovery software. After the file is successfully downloaded, click on the install button and complete the scanning procedures of antivirus or security software that are pre-installed. You can see the get started button on the software. Click on it and you will come across all the readily available options for the instant data recovery. Click on the search button and type the name of the file to be recovered. The scanning process will run by accessing even hard drive for the searched file. Click on the stop button once the file is displayed on the window. Select the file and click on restore that is available on the left-hand corner of the window. Your file will be restored to any wanted folder instantly. There is recovery software that is available on the internet claiming to be the best and fastest of all. Not all of them really works and are compatible with all versions of windows and thus choosing the best and really working software is essential. One of such kinds of software is EaseUS free data recovery software which is widely preferred by millions of users all around the world with all positive feedbacks with evidence. With the user-friendly interface and faster processing speed, any format of files can be recovered instantly to wanted folders on the system. Scanning speed is also the fastest of all available wizards which can detect the required files within seconds and all similar files are shown on the screen while the scanning is on the processing. Why Is It Essential to Ban Hand Held Gadgets for Children Too Young at Age!